Kalkaska County is graced with many miles of one of America’s premier rivers, the Manistee, which has headwaters in northern Kalkaska County and sweeps south and then west on its course to Lake Michigan about 200 river-miles away. Today the Manistee is renowned nationwide among river ecologists for a remarkably stable flow, temperature, nutrient content and oxygen content, all of which creates one of America’s most productive river fisheries. Key to producing that productive environment are porous soils of sand and gravel that allow snow and rain to percolate into the ground, replenishing aquifers and achieving cool, trout-friendly temperatures before flowing into the river through underground seeps and springs. But the riches of the Manistee are so evident, that early inhabitants could perceive them as well. Archaeologists say evidence shows that native people were traveling the banks of the Manistee River for eons, dating back 8,000 years, possibly longer. Though archaeological investigation has not been extensive, research in the 1960s found remnants of camps and burial grounds and small communities at several places along the shore. 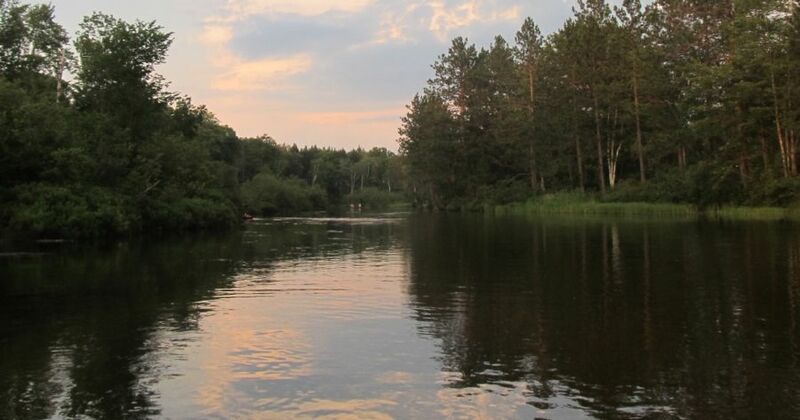 The section of Manistee River that runs through Kalkaska is considered part of the Upper Manistee, and it retains a smaller, more intimate feel than the lower reaches. This section is beloved by canoeists, kayakers and trout fishermen, because it also retains a wild feel, protected as it is by state and federal river regulations and running, as it does, through long stretches of state-owned land where little development is seen. For fly-fishermen, the Kalkaska stretch of the Manistee is legendary for giant brown trout that lie in cover beside fallen trees and under overhanging banks. The fishing draws anglers from around the Midwest and nation during June, when some of the trout’s favorite food—mayflies of various kinds, but especially the brown drake and the hexagenia tk—hatch by the millions, and trout rise to gorge themselves on the bounty. Among the many legendary places in the upper reaches of the Manistee, the rustic campground at the CCC bridge stands out in the minds of river devotees. Throughout trout season, anglers set up camp here on the shores of the Manistee. Just steps from the river, fishermen and fisherwomen get started at daybreak, and at day’s end, they sit around fires, swapping stories into the night, or, more often, fishing late into the darkness in search of giant browns. And of course, for residents of Kalkaska County, the joys of the Manistee are within easy reach and can be a regular part of the day to day.